Such is the ongoing harangue in the golf industry about boosting the game’s popularity that the press material for Tommy’s Honour reflexively raised the question: Is this the movie that finally makes golf seem cool to non-golfers? After all, Tommy’s Honour is also a travelogue, a love story, and a family drama of the father-son variety. This would seem to automatically expand its appeal beyond a genre whose spectrum of themes consists of mystical mumbo-jumbo and Caddyshack, with little in between. 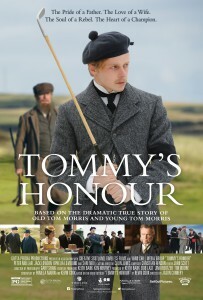 And there’s plenty to like about Tommy’s Honour, starting with excellent production values in creating the often brooding Scottish milieu and the crusty relationship between Old Tom Morris and Young Tom. To that end, the cast isn’t made up of your usual rich Hollywood stars; OK, maybe they’re rich UK stars, but it’s authentically exotic. Morris pere is played by Peter Mullan, of Transpotting fame but instantly unrecognizable under a wooly mammoth of a beard. Young Tom can really hit a golf ball — and also talk trash. Jack Lowden, he of Dunkirk, is Young Tom and is adept at switching gears between earnest, intense but likable kid to rapping a fine, jaunty tune to Ophelia Lovibond when the occasion presents itself. Not that I blame him. Previously appearing in Guardians of the Galaxy, she’s perfect here as the spunky, radiantly cute love interest. The closest to a household name on hand is Sam Neill, who plays an impossibly unctuous club president. In fact, one of the things that I really liked about Tommy’s Honour is that — paean to the game that it avowedly is — it certainly doesn’t sugarcoat it. Based on the book by golf writer Kevin Cook (who wrote the screenplay with his wife, Pamela Martin), you could argue that on balance, the movie shows that most of what the game’s detractors say is true: That it reeks of class tensions and that its putative code of honor is just a cloak for hypocrisy. In golf’s early rough-and-tumble days, according to the movie, matches were sometimes settled with fisticuffs. And in its depiction of such passions, the narrative acknowledges the frequently obsessive-compulsive allure of golf, which is central to the Toms’ conflict. If I have a quibble with the treatment, it’s that there could have been more of the Scottish countryside (there was some) for the young couple to cavort through. But the director, Jason Connery, Sean’s kid, probably wisely moves the proceedings along at just under two hours. It’s an engaging story, briskly told, and thus quality entertainment for all. You don’t have to be a golfer to appreciate, say, a couple of stymie situations depicted; but as Gilda Radnor used to say, it wouldn’t hurt. Opens tomorrow in 32 theaters nationwide.